With these words, in the spring of 311 AD, Roman Emperor Galerius officially legalized Christianity. The quote is an excerpt from Edictum Serdicense, also called “Edict of Toleration by Galerius”. Promulgated by the Tetrarchs, the decree marked the end of persecutions against Christians and restored all their seized property. This was a remarkable civilization act, a unique document formulating for the first time the idea of religious toleration. Even though throughout his life he had been a fierce persecutor of Christ’s followers, a month before his death Galerius suddenly changed his views and issued this directive of toleration. In this way, the town of Serdica (modern Sofia, capital of Bulgaria) entered human history as the birthplace of equality between all religious groups. Today, seventeen centuries later, only a few hundred yards away from Galerius’ palace, the Parliament of Bulgaria is considering issuing a new edict: one that severely restricts religious freedoms. In early October, the lawmakers approved on first reading changes to the Religious Denominations Act that would significantly restrain the rights of minority faith groups, hampering theological schools, clergy training, missionary activity, free worship outside of designated buildings, and international funding of local ministries. One of the highly contentious clauses insisted on a denomination having at least 300 members in order to apply for official registration. 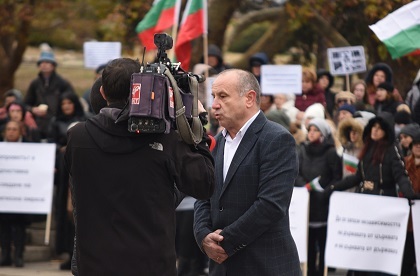 Christians of various denominations in Bulgaria pledged to hold public vigil meetings and peaceful protests until the lawmakers withdraw the legislation. On November 11, they rallied in about ten different towns, including Sofia, Dobrich, Silistra, Burgas, Varna and others. The largest demonstration was in the country’s capital, as some 3,000 people gathered to make a public stand. Evangelical and Catholic pastors spoke to the crowd insisting on the Christians’ refusal to agree with the restrictions. The November 16 deadline for comments by MPs on the amendments saw a new version of the Religious Denominations Act uploaded on the Parliament’s webpage. Prior to that, a November 14 workgroup met including representatives of various faith groups. During the debate, several of the most arguable points were withdrawn by the lawmakers. Bulgarian Evangelical Alliance secretary Greta Ganeva, participant in the proceedings, reported that it had produced some softening on certain provisions. The updated document had conceded items like those that restrained denominational schools, banned international sponsorship and allowed liturgy only within temples. The committee working on the Act draft had removed some of the initial anticonstitutional restrictions. However, other discriminatory clauses remained, and some were made even more restrictive than in the original amendments. For instance, the new draft now raised the minimum membership requirement for registration of religious groups from 300 to 3,000. In addition, this clause may be used with a reverse force, allowing the authorities to close down existing denominations. It is this new version of the draft that is expected to be submitted for second reading at Parliament. No announcement is made as to the date when this might happen. Bulgarian Christians believe that these concessions were due to the fact that international attention to the situation has grown significantly. Statements of disagreement with the new legislation were sent by the World Evangelical Alliance (WEA), the European Evangelical Alliance (EEA), the World Methodist Council (WMC), the European Methodist Council (EMC), the Pentecostal European Fellowship (PEF), the Baptist World Alliance (BWA), the European Baptist Federation (EBF), and the Conference of European Churches (CEC). The World Evangelical Alliance reacted to the proposed legislation in Bulgaria. “As a European Christian organization we are planning to alarm concerned bodies related to the EU Parliament, the European Commission, our network of respected MEP’s, for the proposed amendments to the Law on Religion that violate the freedom of religion”, warned a statement dated November 1, sent to the Bulgarian authorities by Rev. Pelle Hommark, PEF Chairman. CEC also issued a statement regarding the new legislation. On November 13, Rev. Protopresbyter Heikki Theodoros Huttunen, General Secretary of CEC, wrote to the Bulgarian legislators: “According to national and international human rights law experts, who have reviewed the current draft, we note these clauses are not in line with international legal human rights standards.” Among those is the requirement “membership of three hundred people in order for a religious group to obtain the status of judicial entity.” The letter expresses hope that the Bulgarian government would not proceed with the legislation proposals. Neighbor countries also rose to the challenge. The Romanian Evangelical Alliance and the Romanian Baptist Union also wrote letters of objection to Bulgaria’s Prime Minister and Chair of Parliament. “The Evangelical believers consider that they should be protected and sustained by the State authorities to express their autonomy regarding their specific ecclesiastic activities, and no State should favour one faith expression over another”, wrote Viorel Iuga, on behalf of the REA. On Nov. 15, the United States Commission on International Religious Freedom tweeted: “USCIRF is concerned about proposed changes to be voted on tomorrow that would restrict Religious Freedom in Bulgaria.” The tweet included a link to the BWA and EBF statement sent to Bulgarian authorities earlier on November 8. USCIRF is concerned about proposed changes to be voted on tomorrow that would restrict #ReligiousFreedom in #Bulgaria. The BWA Religious Liberty Commission that includes Rev. Christer Daelander, religious freedom representative of the EBF, and Rev. Dimitrina Oprenova, Vice-President of the BWA, approached the Organization for Security and Cooperation in Europe (OSCE), emphasizing that the proposed changes would violate the UN Convention on Freedom of Religion or Belief. As a result, the OSCE Office for Democratic Institutions and Human Rights (ODIHR) submitted a letter to the Bulgarian authorities signaling its readiness to prepare a legal opinion on said draft law. “We will also continue to closely follow developments pertaining to freedom of religion or belief in Bulgaria and would be pleased to hear from you again concerning further developments,” Kishan Manocha, senior advisor at the Panel of Experts on Freedom of Religion or Belief at the OSCE wrote in response. The OSCE/ODIHR experts issued a note to Bulgaria’s president, prime minister, chair of Parliament, ombudsman and other figures of authority: “We consider that the restrictions imposed to religious activities in this text, in particular the discrimination between communities, the procedural and physical limitations and the administrative regulations that the bill would create are problematic in regard to the conventional agreements Bulgaria has ratified.” The address also insists on the suspension of the adoption of the new legislature and for reconsidering it in the light of international standards. The problems with the threatening of religious freedom in Bulgaria also triggered some global media to respond with reports and analyses. In addition to Evangelical Focus and Protestante Digital, the topic was also covered by Transform Europe Network, Global Impact, Norwegian paper Dagen, German news agency Deutsche Welle, Swedish website Världenidag.se, French newspaper L'Info Évangélique, British website Christian Today and US media like CBN News, Baptist Standard, Christian Post, and Christianity Today. As a result, on November 18, Christians rallied for the second time, right after their Sunday morning worship services. 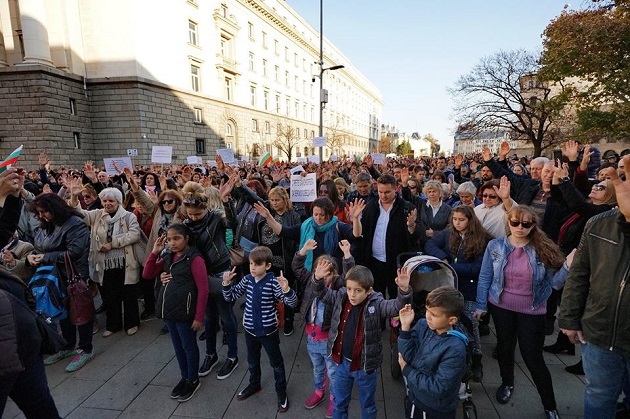 In Sofia, several hundred of them met in a public square, and marched peacefully, stopping for a 20-minute prayer in front of the European Parliament building. 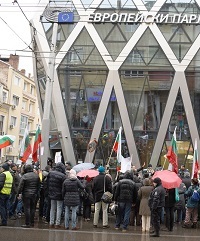 A couple of boulevards were blocked and traffic was impeded in the Bulgarian capital, as Evangelicals and Seventh-Day Adventists sang worship songs and chanted: “Freedom for Our Faith!” During the hour long march the crowd increased significantly, reaching about a thousand protesters. In many towns round the country like Plovdiv, Dobrich, Ruse, and Silistra, many more gathered to pray and protest in public squares. On Sunday, November 25, Christians from all over the nation are planning a third day of prayer and protest. Evangelicals from various denominations have decided to continue their demonstrations until the suggestions for he amendments are completely withdrawn. On December 10, every year Human Rights Day is celebrated across the world. This is the day the United Nations General Assembly adopted, in 1948, the Universal Declaration of Human Rights. According to articles 18-20 from the document, every person is free to enjoy several basic human rights: freedom of thought, conscience and religion; freedom of opinion and expression; freedom of peaceful assembly and association. Just prior to the 70th anniversary of the Human Rights Day, the European Parliament is holding a dialogue seminar with churches and religious communities on the topic of ”Religion and Human Rights within the EU – A Shared Responsibility”. The organizers of the two events on December 4-5 have invited Rev. Dr. Daniel Topalski, president of the Methodist denomination in Bulgaria and representative of the Bulgarian Evangelical Alliance in EEA, to take part in the discussions. Pastor Topalski will address the Denominations Act amendments in Bulgaria and will speak to MEPs about that. Even though the Universal Declaration of Human Rights guarantees the freedom of faith, of expression and of peaceful assembly, today six of the seven parties in the Bulgarian Parliament continue to push legislation contrary to those basic rights. The Christians in Bulgaria are still intentional on appealing to the lawmakers to drop these totalitarian amendments. Prayers towards that goal are now appreciated more than ever. (1). Lactantius, De Mort. Pers. ch. 34, 35. Opera, ed. O. F. Fritzsche, II, P. 273. (Bibl. Patt. Ecc. Lat. XI, Leipzig, 1844.